No surprise: a hybrid joins the NX line too. 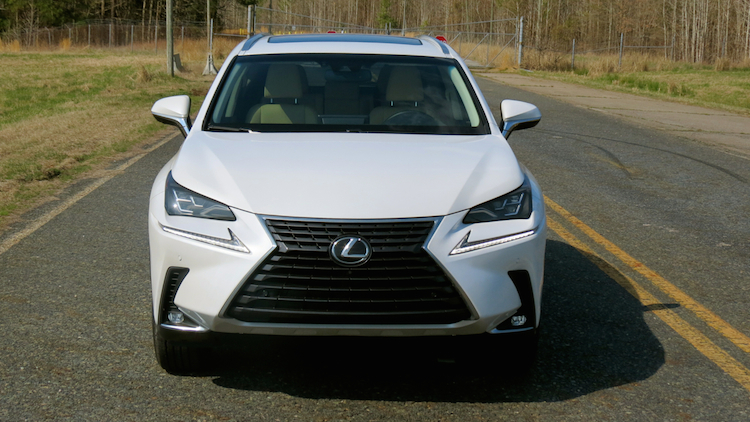 An aggressive face marks the 2015 Lexus NX. 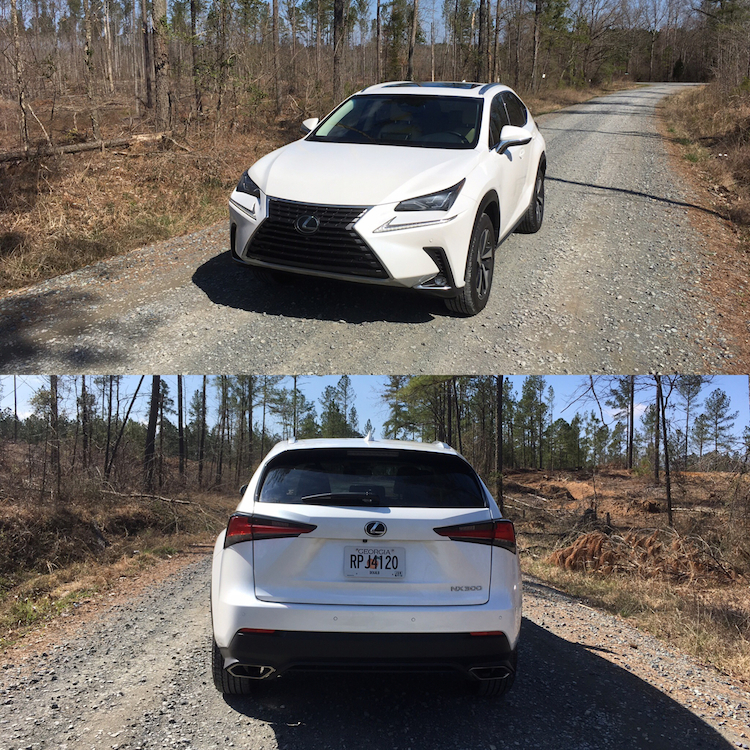 Lexus made the most logical move in 2014 by introducing a new crossover utility vehicle to slot beneath its segment-leading RX line. Since the dawning of the new millennium, consumers have turned to utilities in increasingly significant numbers, thus the outlook for entry-level premium models is an especially promising one. 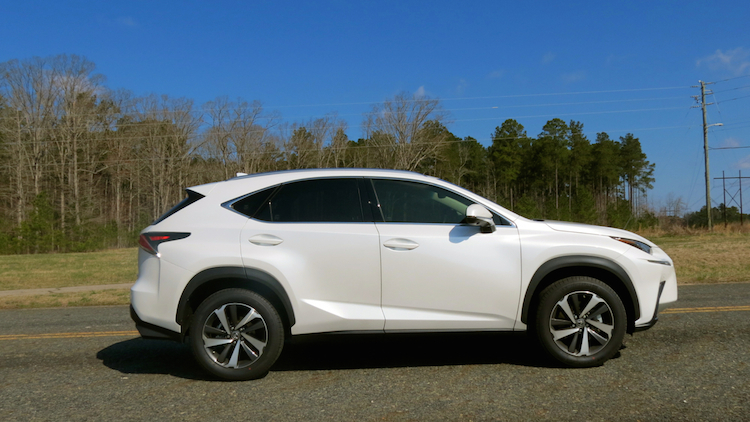 Likewise, Lexus had to reciprocate and has done so by means of its all-new for 2015 NX line. 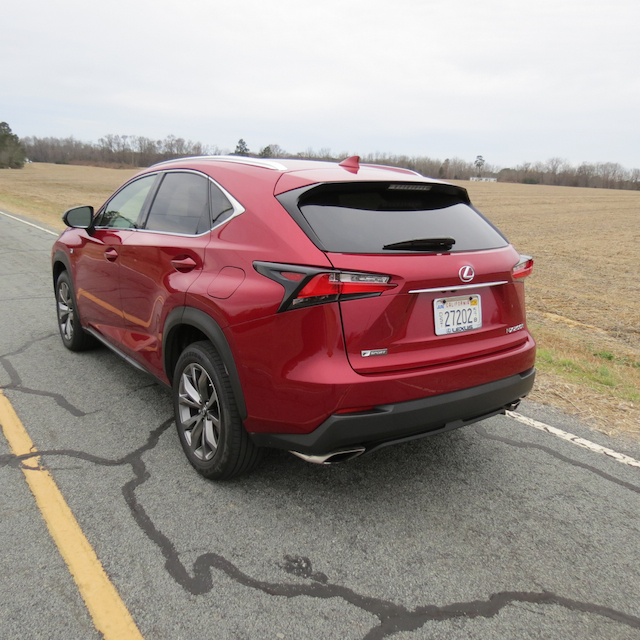 The Lexus NX is based on the same platform underpinning the Toyota RAV4 and yet the similarities largely stop there. The NX has its own sheet metal, unique interior and offers a twin-scroll turbocharged version of the RAV4’s 2.0-liter four-cylinder engine. A naturally-aspirated version of that engine is sold in two consumer markets — China and Russia — with a hybrid variant also available in the US. The standard front-wheel drive 2015 Lexus NX is priced from $34,480 for the 200t edition ($35,880 for all-wheel drive). Select the F Sport edition and the price starts at $36,580 ($37,980 AWD). Opt for the hybrid 300h and the starting price comes in at $39,720 or $41,310 when equipped with all-wheel drive. Lexus loaned me a front-wheel drive F Sport edition for a week just as 2014 closed. That model came with a premium package ($2,890), a navigation system package ($2,140) and a comfort package ($505). Other options included a blind spot monitor with rear cross-traffic alert ($660), a pre-collision system with radar cruise control ($900), intuitive parking assist ($500) and forged alloy wheels ($3,200). At the dealer level you can select running boards, a tow hitch receiver, and other accessories. Fully loaded, you might pay upwards of $48,000 for one. Subsequently, I checked the local Lexus dealer inventory and found six in stock priced from the low- to mid-$40,000 range. These prices are in line with the competition, namely the Lincoln MKC, Audi Q3, Volvo XC60, BMW X3, Acura RDX and the Mercedes-Benz GLA Class. The NX’s fascia advances Lexus’ current design language. Most current models are dominated by a spindle-shaped grille and feature various L-shaped characteristics, including the LED daytime running lamps, headlights and fog lamp channels. 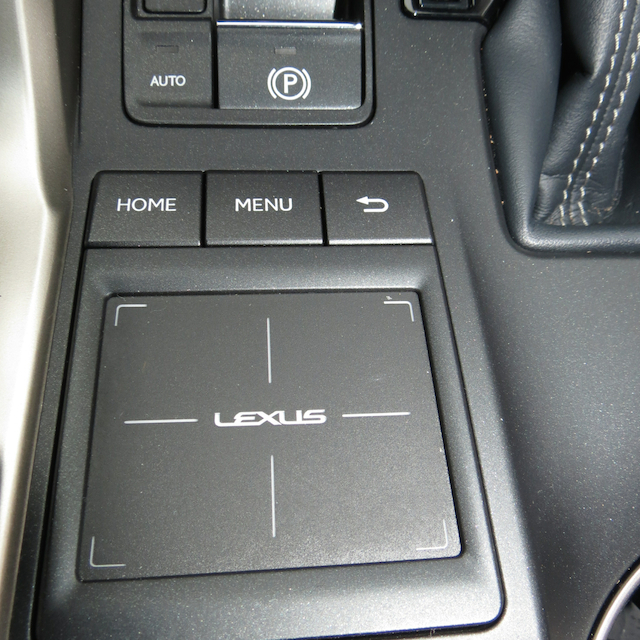 The “L-finesse” look does, of course, augment Lexus’ symbol, itself a stylish “L” design. Yes, I must concur with anyone else who notices that the LED daytime running lights resemble Nike’s energetic swoosh symbol. To my knowledge the two companies are not engaged in a co-marketing campaign. To the rear, you have sharply angular tail lights, chrome trim and a pair of exhaust tips flanking a diffuser. When it comes to the NX’s profile it resembles the current generation RAV4 than not. And yet, you will find different door panels and a modified side window layout in the NX. Disclaimer: my wife drives a 2013 RAV4, a vehicle that this writer is thoroughly acquainted with. No matter, there are far more differences between the two as Lexus has put its own imprimatur on this compact conveyance. 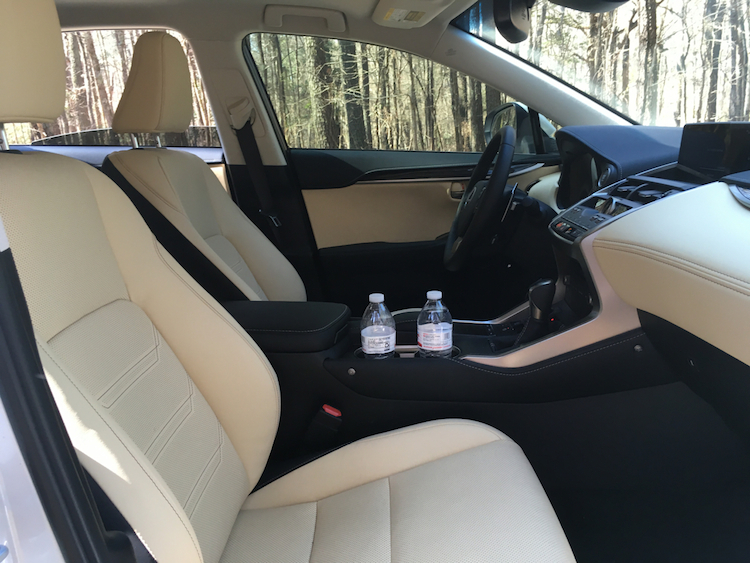 The NX’s cabin has a more pronounced Lexus touch. Immediately evident are the two overhead and one driver footwell LED lights. Two more LED lights serve as the front map (or reading) lights, sensory activated at that. Personally, I am glad that more manufacturers are making use of LED cabin lights — once you have them you will not want to settle for anything less. 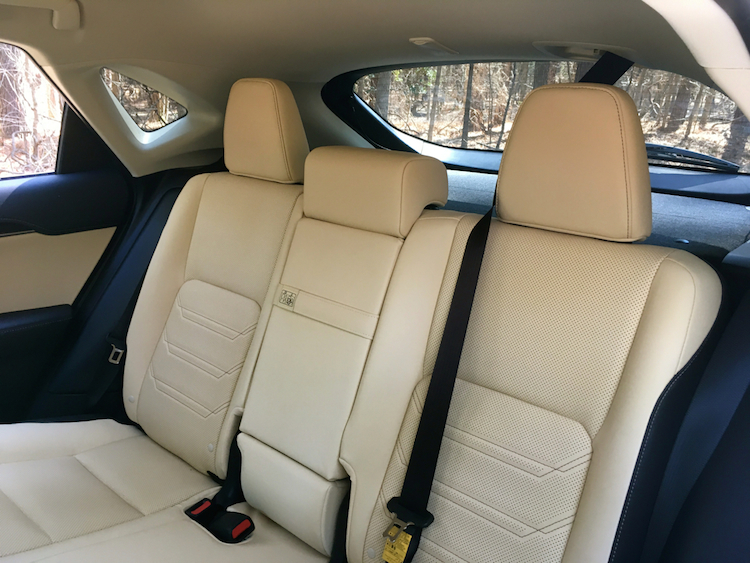 The Lexus NX offers no-compromise seating for five. 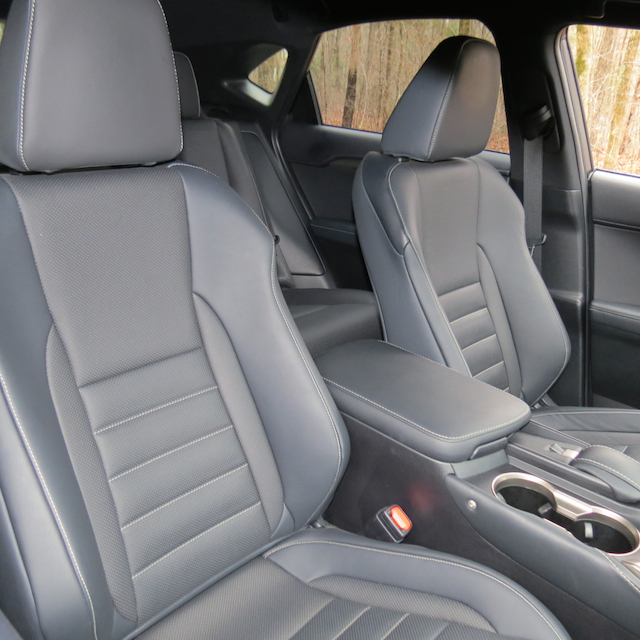 The front bucket seats are extra bolstered with oversized active headrests. 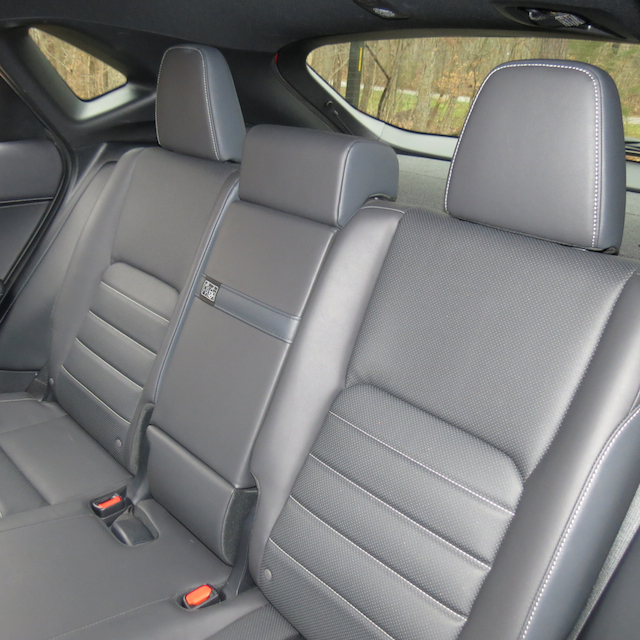 No seat extenders are present, an addition that makes long road trips and sport driving more enjoyable. The rear bench seat is a split 60-40 design with a plush fold down armrest with a pair of pop out cup holders. That would have served as a welcome place for a storage compartment. Nonetheless, rear seating passengers have access to rear seat pockets and in-door storage, the latter large enough to hold bottled drinks. 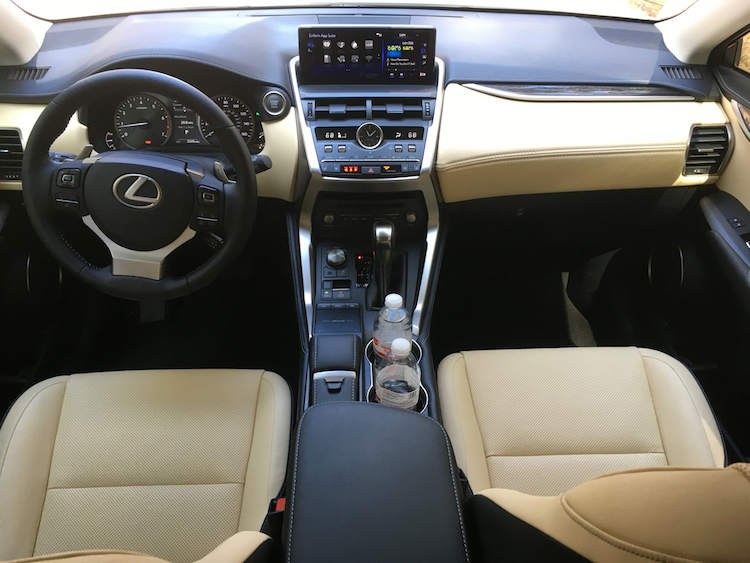 Lexus’s designers were all over this crossover’s interior, with stitching evident across the upper and lower parts of the dashboard. 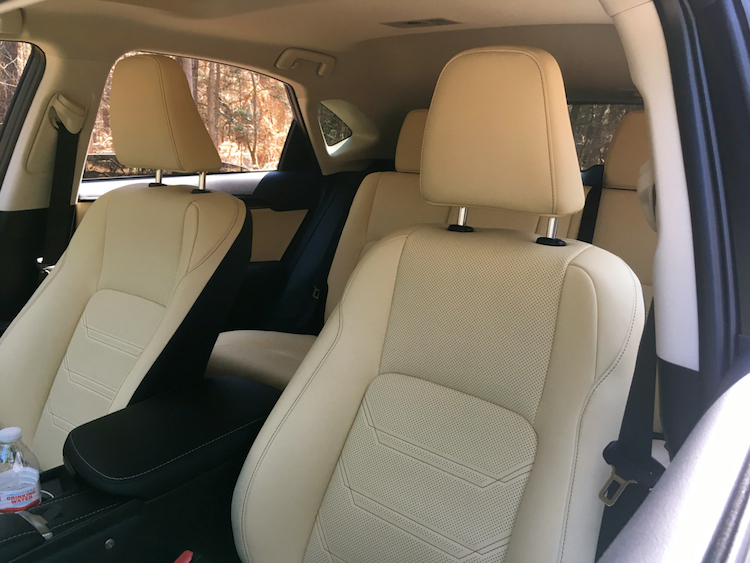 Brightwork trim, soft touch materials and NuLuxe covered seats, door inlays and storage compartment covers boost this interior. NuLuxe has the appearance and caress of leather, but it is not. On the contrary, NuLuxe represents the brand’s environmental awareness, weighing half as much as leather and generating significantly less carbon dioxide emissions in the manufacturing process. Moreover, no animal products were used in the manufacturing process, to the unbridled relief of animal-rights activists. The NX’s instrument panel is composed of tachometer and speedometer displays, flanking a digital driver’s information system. That system is controlled by switches located on the face of the tilt and telescopic steering wheel along with cruise and secondary audio controls. The center console is dominated by a tablet-sized screen, what is permanently fixed to the dashboard. Beneath that are switches and buttons for climate control with the temperature read outs flanking an analog clock. A special touchpad offers one-finger control of the display screen. Instead of fiddling with knobs, buttons and switches as you make your way down the road, you can control the screen with just a touch of a finger. Consider it Lexus’ attempt to reduce technological distractions — you will get the hang of using it quite fast. Behind the rear seat is covered storage with a full-size spare underneath. Additional compartmentalized storage is located next to the tire. Tie down hooks are present and ready for strapping. If you are of the family way with the little ones, there is tethering in place for a center-positioned car seat. While other manufacturers have been embracing turbochargers for years, the Toyota Motor Corporation has eschewed the technology. Until now. In the NX 200t, you have the company’s first use of twin-scroll turbocharged technology, designed in house to deliver superior quality and performance. This gasoline direct-injected engine features a pair of exhaust gas inlets and nozzles, and makes 235 horsepower and 277 foot-pounds of torque. 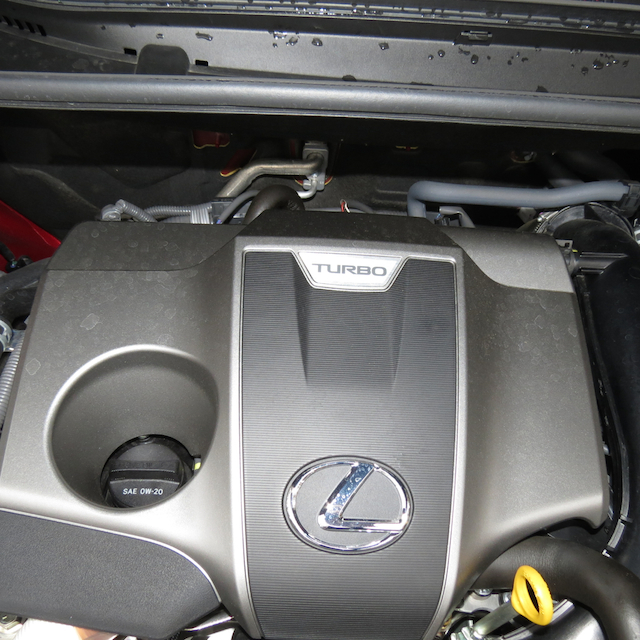 Lexus weds this engine with a shiftable six-speed automatic transmission and paddle shifters. The outcome is a near imperceptible lack of turbo lag and more than enough power to move this ute with authority. 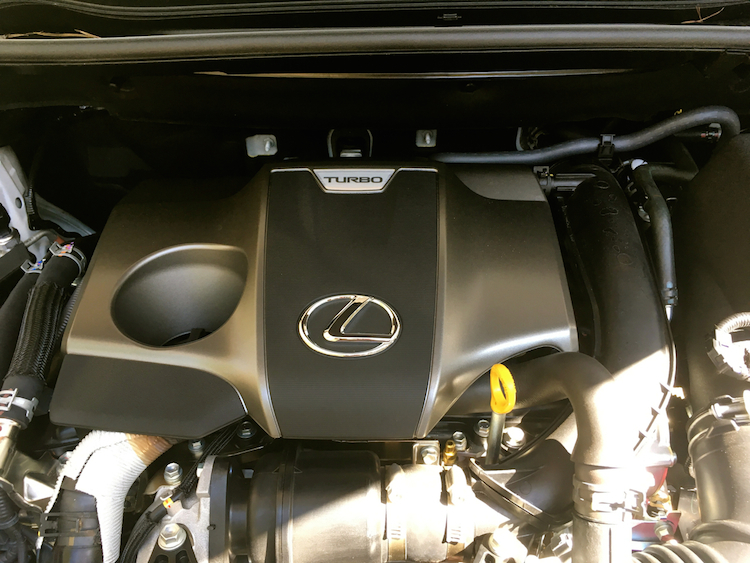 Where the naturally-aspirated version of this engine is sufficient to accomplish the job, Lexus was not about to rest on its laurels and has, instead, delivered performance that should engender respect from enthusiasts. Moreover, the new engine signals to all that Lexus as well as Toyota and Scion will bring forth additional models featuring the science. Now if we can only convince Lexus to manufacture diesels. Jump in, adjust the seat, fasten your seatbelt and hold on. Well, not exactly. Crossover utility vehicles rarely generate the driving elation found in sport coupes and sedans or in the rare performance utility vehicle such as the Jeep Grand Cherokee SRT or the Infiniti QX70. At the same time the Lexus NX 200t will not lull you to sleep. Notably, the F Sport edition does its best to bring out the ute’s performance side. All models feature MacPherson struts up front and double-wishbone suspension in the rear. Exclusive to the F Sport are front and rear performance dampers and a sport-tuned suspension. In addition, you get a dynamic digital display, what allows you to observe the data to track your performance, including G-force and turbo-boost monitor. 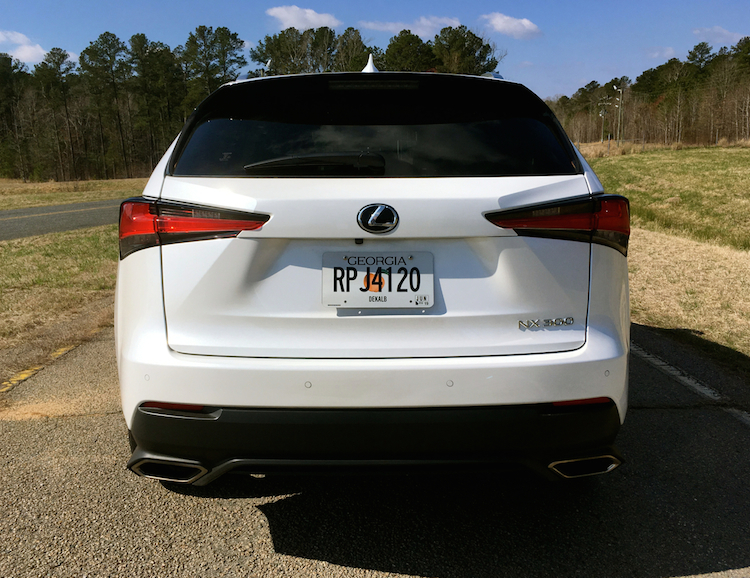 It seems a bit strange to offer that information on a utility vehicle, however Lexus wants to amplify its performance credentials, not bury it. For this model’s best driving mode, choose Sport and leave “normal” and “eco” to your more sedate driving. Press the pedal to the metal and you can reach 60 mph in just under seven seconds. As this was a front-wheel drive model, understeer is evident — really, no surprise there. At the same time the NX does a good job of handling twists and turns, and its braking is strong with no fade present. Certainly, the NX does not offer the drive fun of a Jeep Grand Cherokee SRT, but then you’re not paying $70,000 for this crossover as you would with the Jeep. In the NX, Lexus adds a fourth entry-level model to the brand. You also have your choice of the rear-wheel drive IS line, the front-wheel drive ES and the hybrid CT 200h. 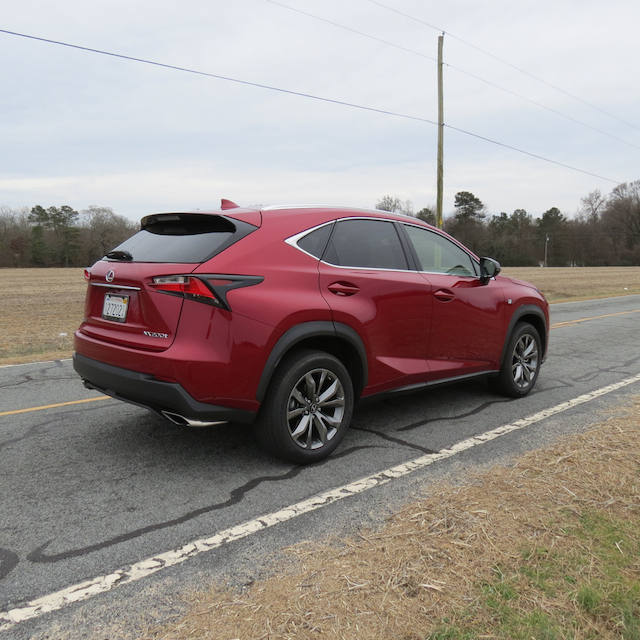 To that end, if you aspire to upgrade from your current Toyota or Scion, or if you have some other luxury utility vehicle in mind, then the Lexus NX may make the grade. Furthermore, there is a hybrid variant for your consideration, the only one of its kind in this burgeoning segment. 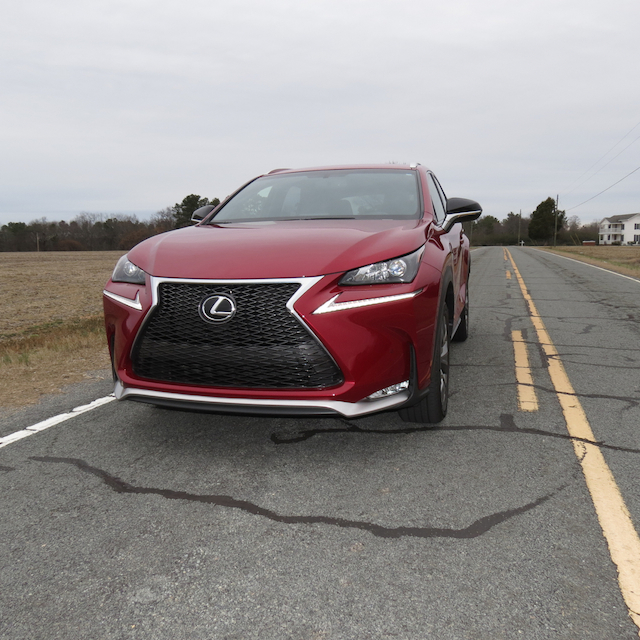 2015 Lexus NX photos copyright Auto Trends Magazine.